"Capo di tutti capi or capo dei capi, often referred to as the Godfather in English, is Italian for 'boss of all bosses' or 'boss of bosses'. It is a phrase used mainly by the media, public and the law enforcement community to indicate a supremely powerful crime boss in the Sicilian or American Mafia who holds great influence over the whole organization. The title was introduced to the U.S. public by the Kefauver Commission (1950). It has seldom been given to specific bosses because it could create tension between different factions (otherwise known as families) within the Mafia. Typically the title is awarded to the de facto boss of the most powerful Mafia family." 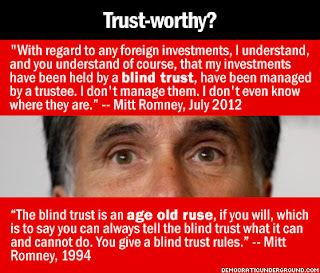 In the American Conservative Mafia, Mitt Romney as heir apparent is presently the Republican Party's capo di tutti capo. Past godfathers of the Sicilian Mafia have been jailed or deported as their crimes were brought to public light, but the former punishment would seem to be the only remedy for Romney, unless a birth certificate would prove that he - like his father - was born in Mexico. Certainly, we would not wish to impose as deadly a Conservative as the ex-governor on our friends South of The Border, but Romney appears on a collision course with the legal system and they should be prepared for the worst. 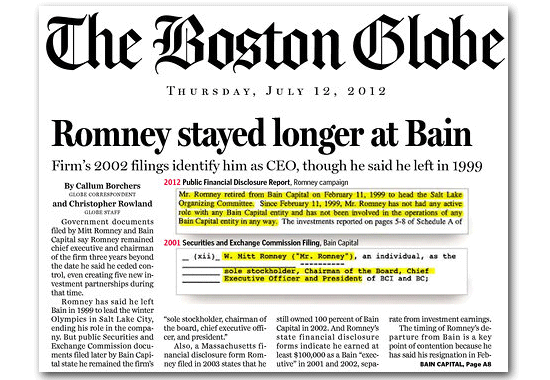 "Mitt Romney Public Financial Disclosure Report, Aug. 11, 2011: Mr. Romney retired from Bain Capital on February 11, 1999 to head the Salt Lake Organizing Committee. 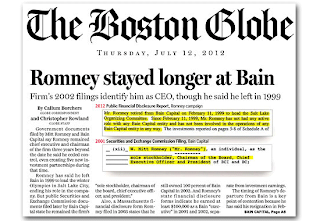 Since February 11, 1999, Mr. Romney has not had any active role with any Bain Capital entity and has not been involved in the operations of any Bain Capital entity in any way." Making false statements to the federal government is a serious crime (under 18 USC 1001) carrying possible fines and up to five years in federal prison. he wants us to elect him to the Presidency in 2012. On further reflection, the surrender of even thirteen years of Mr. Romney's 1040s may doom his chances for the Presidency. Although the Conservative crime syndicate has successfully boosted convicted criminals to the Presidency, as seen in the posting, "Bush Jr.'s Skeleton Closet,"at http://realchange.org/bushjr.htm, the record was carefully hidden from public view by his handlers. And with the judicial coup de etat, courtesy of the once-hallowed Supreme Court, we were encumbered with one of the most hated presidents in American history. Romney has only a few options. He could re-write his returns and release the falsified returns. 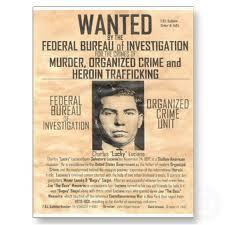 The only return he released was 55 pages long and the information on prior and subsequent returns will be cross-checked by the media, so changing the information will be tricky without a batallion of accountants and attorneys sworn to the Conservative code of omerta. The branding of Conservatives as a criminal syndicate is no accident; the proof has been written down throughout our country's history and is only growing more brazenly as the Conservatives' dream of absolute power becomes a reality.